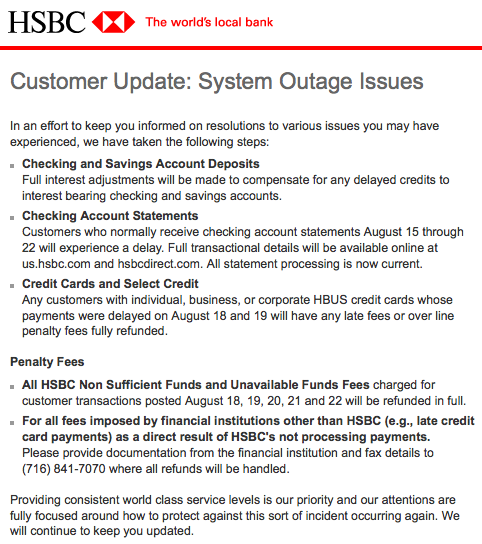 In the Wake of an Outage: Is HSBC Direct Reliable? I want to update you on our recent systems issue and extend my apologies for any inconvenience you may have experienced in trying to access your HSBC Direct account. Our teams have worked diligently to test and re-engage the impacted systems to ensure that we are able to return fullâ€“system functionality to you as soon as possible. Most of the impacted systems are now up and running and we continue to work through any remaining issues. As part of HSBC Group, one of the largest and most highlyâ€“capitalized financial institutions in the world, with over 140 years of experience helping our customers achieve their financial goals, we remain committed to meeting your needs and understand how important continuity of our online services are to you. I will continue to keep you updated on our progress, and again I sincerely apologize for any inconvenience this system issue may have caused you. And I thank you for saving with HSBC Direct. Head of HSBC Direct U.S. When I clicked through, I learned that checking and savings account deposits had been interrupted, account statements were affected, credit card payments were delayed, and people were facing a myriad of penalties and fees. See below for the complete rundown. The good news is that they (eventually) owned up to their problems and are attempting to make things right. Unfortunately for them, online savings accounts are a dime a dozen, so there’s little reason to stick with them in the wake of such problems. Fortunately, none of our transactions were directly impacted by this. Nonetheless, we’ve lost confidence in them and will be moving our funds elsewhere. In this case, elsewhere is FNBO Direct, which offers 3.50% APY and is also rated as the safest online savings account out there. In case you’re curious, I’ve written a review of FNBO Direct. What I found the most inexcusable was the inability to contact customer service. I needed to transfer the money asap or I would have lost the car. All I could get was a recording, saying they were down for “Maintenance”, when I really needed to talk to a person to find what my options were. Could I execute a phone transfer? Could I go to a branch and withdraw the money? There was no way to find out. The best part of it all was that the “nobody home” voice mail was done by an Indian. Thanks for your comments Mike. We’re keeping our account open in case of a (possible) future change of heart but, for now, I’m not leaving money there that we need to access on relatively short notice. Had this happened a few weeks later, we could’ve really been stuck — estimated tax payments are due Sept 15, and that’s where we’ve been doing our “self-withholding.” If their rate moves up to beat everyone else, I’d be okay with leaving money there that we don’t need to access, but we won’t stay there for the same rate we can get elsewhere. 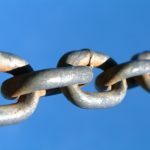 Nickel is right–the problem isn’t that there was downtime, it’s the duration of the downtime. HSBC was probably skimping on it’s IT infrastructure. Their horrible customer service compounded the problem. I’m certainly glad they didn’t bounce any of my checks–I feel sorry for anyone who is going to contact them to try to get their money back for the NSF fees from other institutions. I was trying to buy a car during that time and couldn’t transfer money online, so I executed a phone transfer. The next day, when the online system was down I tried to call customer service and couldn’t actually reach a person to find out if it had executed. All I got, after navigating the menus, was a recording. Fortunately, there’s a branch near me so I was able to go in and get my money. I’m keeping my HSBC account for now, but I did move about half my money elsewhere to protect myself against this kind of problem in the future. This time, and every time in the past, I’ve needed to contact customer service with HSBC, it’s been frustrating. I’ve even had them tell me that they can’t help me because it’s after “online banking business hours”. WTF? If I wanted bankers’ hours, I’d have stuck with BOA. I may just give up and find another bank next time. Stu: To each their own. However, this problem was caused by a hard drive failure, and it took them nearly a week to fully recover. I’m not sure about you, but I expect an online bank to have better redundancy than that. While they have hopefully learned a lesson from this and will be better in the future, we already have accounts at all of the major online banks, so why stick with them? 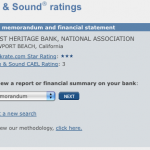 aa: Same rate, but two notches higher in terms of Safe & Sound rating. Also, the robbery analogy doesn’t hold. This was an internal problem with their own systems, not an external occurrence like a robbery in an otherwise safe neighborhood. The problem wasn’t so much the hardware failure, but the length of time it took them to restore things. I think its a ridiculous question, and to be moving funds out is laughable. NOBODY can garuntee 100% uptime or 99% uptime. The goold old 5 nines.. But hey, your money you do as you please. If they hadnt been upfront and just been vague about an interruption would you still be moving funds out?